Doc Rivers had a bittersweet family moment when the March Madness field was revealed on Sunday. He was ecstatic to learn that his youngest child, Spencer, and the University of California, Irvine will play Kansas State on Friday in the NCAA men’s basketball tournament. But he was disappointed that he wouldn’t be able to cheer on the Anteaters in person in San Jose because he’ll be coaching the Los Angeles Clippers in Cleveland that day. 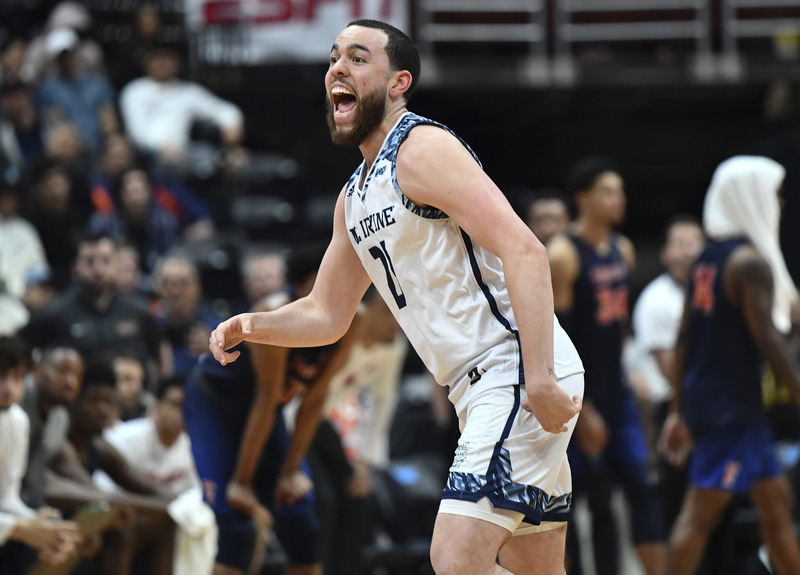 Spencer Rivers will be making his first NCAA tournament appearance, joining his father and older siblings who have made it onto college sports’ biggest stage. Doc Rivers starred at Marquette University from 1980-83 and made two NCAA tournament appearances. His eldest child, Jeremiah, played for the Georgetown squad that advanced to the 2007 Final Four and the second round in 2008. His daughter, Callie, was an outside hitter for Florida’s volleyball team, which went to the NCAA regional semifinal each year from 2007-10. And son Austin played on the No. 2 seed Duke team that was upset by C.J. McCollum and 15th seed Lehigh in their opening game of the 2012 NCAA tournament. If the 13th-seeded Anteaters can pull off the upset on fourth seed Kansas State, there will be added victory for Spencer. UC Irvine guard Spencer Rivers celebrates the Anteaters’ 92-64 victory over Cal State Fullerton in the finals of the Big West conference tournament at Honda Center. “My goal right now is just to beat Austin’s record. At least get one win in,” Spencer said. Austin Rivers will be rooting for that outcome too. Spencer’s mother, Kristen, Jeremiah and Callie plan to be at the UC Irvine game. Austin, however, will be on the road with the Houston Rockets visiting the San Antonio Spurs. Even if UC Irvine upsets Kansas State, neither Doc Rivers nor Austin would be able to make Spencer’s next potential game Sunday because they both have NBA games that day too. “As soon as the schedule came out, I was hot,” Austin said. Doc Rivers (second to left) along with his family. Doc Rivers said he has gone to close to 10 of Spencer’s games this season, including one on a Clippers game day. On Jan. 14, 2017, he was at Staples Center in downtown Los Angeles coaching the Clippers past the Los Angeles Lakers, 113-97, in a game that started at 12:30 p.m. Afterward, he drove 45 miles to Irvine for his son’s game, which started at 5 p.m. The longtime NBA coach was also able to go to his son’s senior day this season. 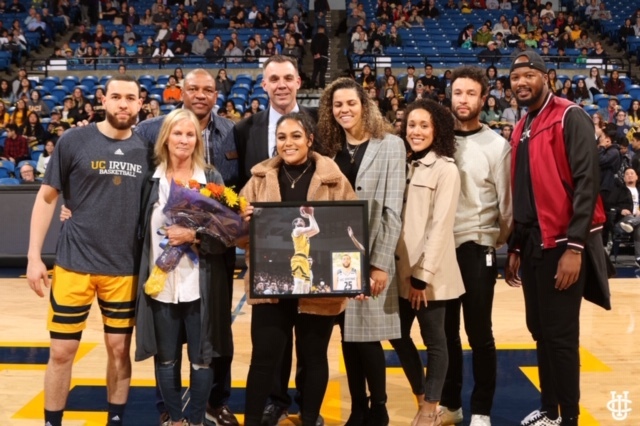 And perhaps best of all, he saw Spencer score two points in 15 minutes as UC Irvine defeated Cal State Fullerton in the Big West tournament championship game on March 16 to earn a spot in the NCAA tournament. His children appreciate his efforts to support them. Spencer Rivers, right, watching his brother, Jeremiah, along with his parents back in 2013. What makes Spencer’s appearance in the NCAA tournament especially sweet for the family is the challenging road he took to get there. Spencer said he turned down some small-college scholarship offers in Florida to be closer to his father in the Los Angeles area while in college. The 6-foot-2, 200-pound point guard was a walk-on at UC Irvine’s basketball program during the 2014-15 season. He missed the entire 2017-18 season with a broken foot and strongly considered giving up college basketball. Ultimately, Spencer decided to return for his final college season. Spencer wasn’t cleared to play until about three weeks before the season started, but the decision to return paid off for the reserve guard as he earned a spot in the Anteaters’ rotation off the bench. After finally shaking off the foot injury, he has averaged 2.3 points and 17.6 minutes over the last eight games. Now he’ll get to participate in the second NCAA tournament appearance in school history. And the family will cherish it, whether near or far. Spencer Rivers is expected to graduate from Irvine with a degree in sociology this spring. He plans to follow in his dad’s footsteps in basketball in some capacity, perhaps starting as a Clippers intern this summer. It’s something his father can see happening too.